The Futsal Ferns’ golden introduction to the international game has continued after sweeping all before them across the ditch to claim the Gold Coast International Futsal Challenge title. Despite only being formed less than two years ago, it’s the second piece of the silverware picked up by the Futsal Ferns, who also won the Trans-Pacific Futsal Cup against New Caledonia in their debut outing in September of 2017. Their latest success came at the expense of some of the finest domestic teams in Australia, the Ferns defeating Football Queensland, Football West and Football Victoria on two occasions each in a double round robin. “We’re all very happy with what we achieved,” coach Nic Downes says. 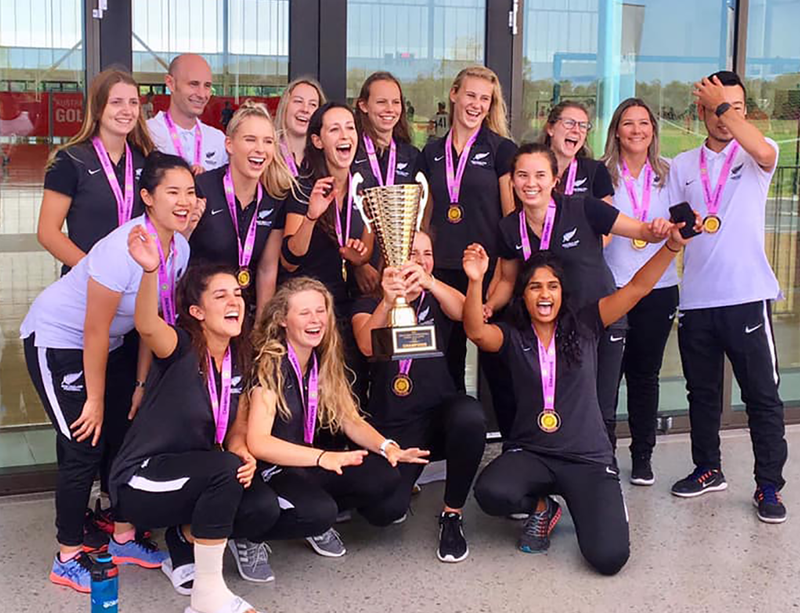 The New Zealanders were deserving winners, underlining their superiority by outscoring their opponents 24 to eight across their six matches and playing an entertaining brand of futsal. The goals were shared around with nine different players finding the net but Dayna Manak and Rebecca Lake top scored with four each while Leah Gubb and Tessa Leong both notched three. Jess Verdon, Sarah Alder, Maxine Cooper and Francesca Grange all struck doubles. Captain Cooper and her team mates had little idea of what to expect when they crossed the Tasman but Downes says the standard was high. “It was unknown and we played in the first game so we had no way of seeing the other teams before hand,” he admits. Downes says the opportunity to tackle a variety of opponents was hugely beneficial. The successful Australian trip means the Futsal Ferns have now won all nine of the matches they have been involved in, laying a strong foundation for future progress. “It’s a fantastic start and we’re very proud of that, it’s a great little record to have,” Downes says. The players don’t have to wait long to be in action again as the rebranded Women’s Futsal Superleague – previously known as the National Women’s Futsal League – is set to take place in Wellington from February 15 to 17. The longer-term goal is to be ready to compete with the best when a historic inaugural world competition rolls around – a prospect that is now very much on the radar after being included in FIFA’s ground-breaking strategy for women’s football, launched in October of last year. “We’re seeing more and more activity around the women’s space so we’ll look for another opportunity to bring the squad together and just continue to build so that when a World Cup does arise we’ll be ready to go rather than starting from scratch,” Downes says.